Wirt iż-Żejtun is this year commemorating Michele Cachia – an architect and engineer – whose works during the final years of the Knights’ presence in Malta and at the start of the British era are found throughout various localities in Malta, including various gardens. The garden known as ‘Ġnien Luqa Briffa’, but also known as ‘Tal-Kmand fiż-Żejtun’, is one of a series of ‘Kmand’ type gardens throughout Malta designed and built by Cachia with other ‘Kmand’ gardens in Qrendi, Safi, Għargħur and Lija, and others lost over the years at Żabbar, Żebbuġ and Naxxar. The story behind these gardens goes back to the 19th Century when the British Government awarded them for the personal use of Maltese lieutenants who led the blockade against the French, gardens that were all designed by architect Cachia. The President of Wirt iż-Żejtun, Ruben Abela, said that apart from these gardens, Cachia remains well-known for other high profile works including the Floriana Granaries, Montgomery House in Floriana and the portico of the Providence Chapel at Siggiewi. Abela said the works are regarded as ‘the Cachia dynasty’ as described by Judge Giovanni Bonello in his writing, in other words a familiar hallmark of architecture and architects. Researcher Mevrick Spiteri said that Cachia was one of 12 architects selected by the Order of St John and had carried out works for the Order at the end of 1780 with plans around the Selmun area. 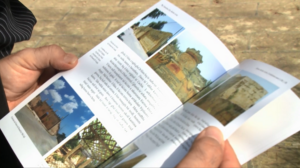 Aided by funds of the Kunsill Malti for voluntary organisations, Wirt iż-Żejtun launched a book to document Cachia’s patrimony and legacy. Minister Helena Dalli urged works such as these to continue so that culture increases and becomes more widespread.